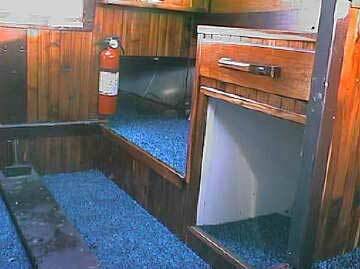 3/8" Miriti plywood hull with fiberglass overlay hull and decks Sleeps 4, double vee birth forward and 2 quarter berths port and starboard. Porta Pottie storage area. Storage under all berths and cockpit seats. Galley cabinet. 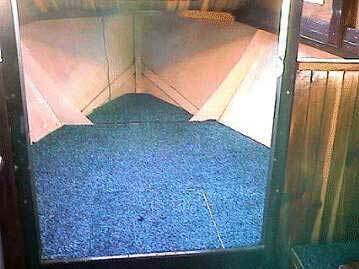 4 opening portholes AND forward and aft cabin hatches making for very good ventilation. 22' Aluminum mast. Almost new Main sail. Used but good Jib. Raise/lower motor mount. Mast is steppable by one person with winch system...VERY easy to do. 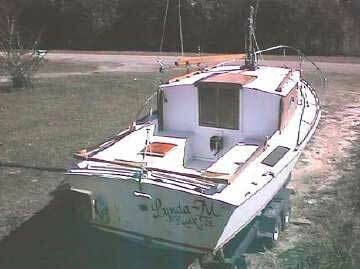 Swingkeel is 1" thick plate steel affording good ballast and making her a very stable boat. Trailer is "double axle" with 4 of the smaller wheels (bearings recently greased and tires are almost new) to make launch and load easy and quick. Tongue extension is not necessary. You can launch rig and sail in less than 45 minutes. All lights working. 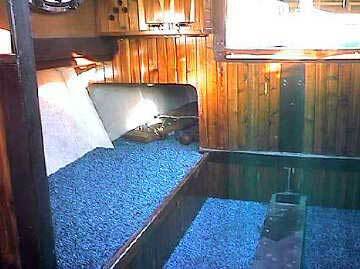 Draft is 18" keel up and 3-1/2' down, great for deep water or shallow sailing. Self bailing cockpit is very roomy. Cabin has FULL sitting headroom. AM/FM radio/Tape. Cabin is lined with Eastern Red Cedar all sealed and varnished. All running lights and cabin lights working. Foam floatation under cockpit and forward vee birth. and carling areas. All rigging in good condition. She needs some touchup paint, some touch up deck work and brightwork, but is in overall good and ready to sail condition. Available for inspection, call for date and time. 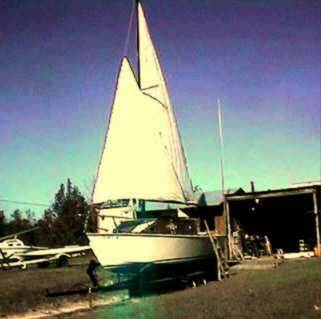 I built her myself, and I am a professional boatbuilder for number of years and custom commercial woodcrafter for nearly 30 years.